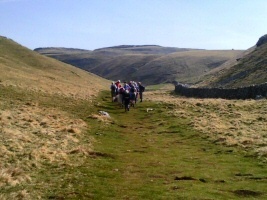 Sutton-in-Craven Rambling Club organises a programme of led walks on alternate Saturdays throughout the year. 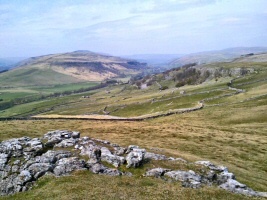 The walks are usually eight to ten miles long and take in some spectacular scenery around Yorkshire and Lancashire. During the summer months, occasional mid-week evening walks are arranged - these are between three and five miles long and are usually followed by supper. 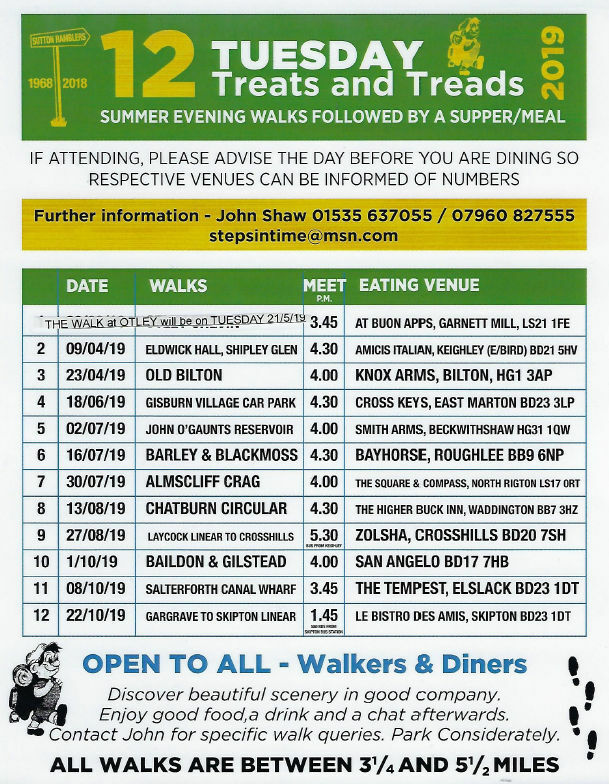 Walking is an excellent form of exercise for all ages, if you would like to try one or two of our Saturday walks just check the programme below and call for details or turn up for 9 o'clock prompt on Church Road outside the County Primary School. All you need are a pair of hiking boots (not trainers), a packed lunch, a mid-morning snack and clothing suitable for the weather conditions. The year 2018 is the 50th anniversary of the walking group. Originally known as 'St. 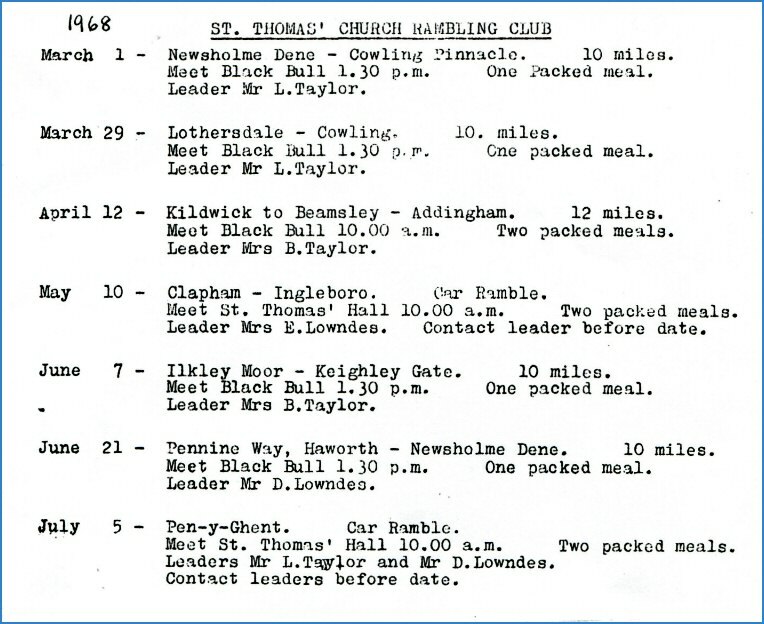 Thomas' Church Rambling Club', the name was changed to 'Sutton-in-Craven Rambling Club' in 2011. To mark the 50th anniversary, the first ever programme of walks from Spring 1968 is shown below. 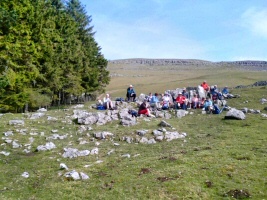 full day 7½ 60 Bartle Trail, packup & pub meal. 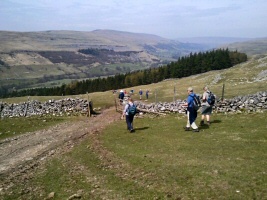 Sutton-in-Craven Rambling Club is an independent club. Subscription is currently £5.00 per year, reduced from £9.00 in 2012. All members must obey the Club Rules, copies of which are available from the Secretary. A selection of maps, walking guides and the Ramblers' Association Bed & Breakfast Guide are available for loan from the Secretary. Will all new members please ensure that the Secretary has their name, address and telephone number. 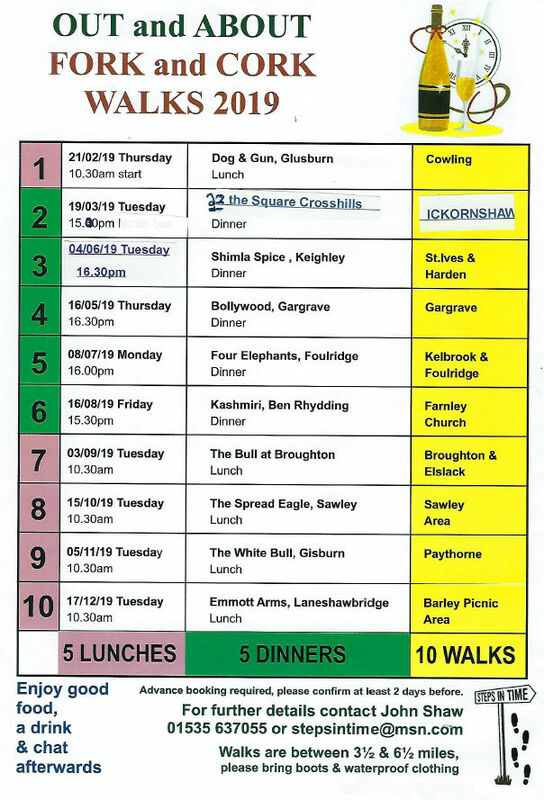 Unless stated otherwise, all Saturday walks start at 9am and all evening walks start at 6pm from Sutton-in-Craven County Primary School, Church Road, Sutton-in-Craven. If in doubt contact the walk leader. Please bring sufficient food and drink for two meals. You are welcome to join us on a couple of walks with no obligation to join. The Club and its leaders cannot accept any responsibility for personal loss or injury whilst taking part in walks. All dogs remain the sole responsibility of the owner and must be kept on a lead at all times. Walkers must be under the direction of and keep within communicating distance of the leader at all times. All photographs by Paul Wilkinson unless otherwise stated.